Injectable, synthetic heat shock protein 90 (HSP90, click here for basic info) inhibitor for cancer. Click here for more info on why HSP90 inhibition is rationale target for cancer therapy. 2010 10k: "Ganetespib potently inhibits Hsp90, a chaperone protein required for the proper folding and activation of other cellular proteins, particularly kinases. Many of these "client proteins" of Hsp90—such as AKT, BCR-ABL, BRAF, KIT, MET, EGFR, FLT3, HER2, PDGFRA, VEGFR—have been shown to be critical to cancer cell growth, proliferation, and survival and are the targets of clinically validated and approved cancer drugs, such as Gleevec, Avastin, Herceptin, Sutent, Nexavar, Tarceva, and Erbitux." COM patent offers worldwide protection to mid 2020's, formulation and biomarker patents extend several additional years. 2010 10k: "With respect to our Hsp90 inhibitor program, we have 6 issued U.S. and foreign patents, and 104 pending U.S. and foreign counterpart patent applications. Any U.S. or foreign patent that issues covering ganetespib will expire no earlier than 2025. 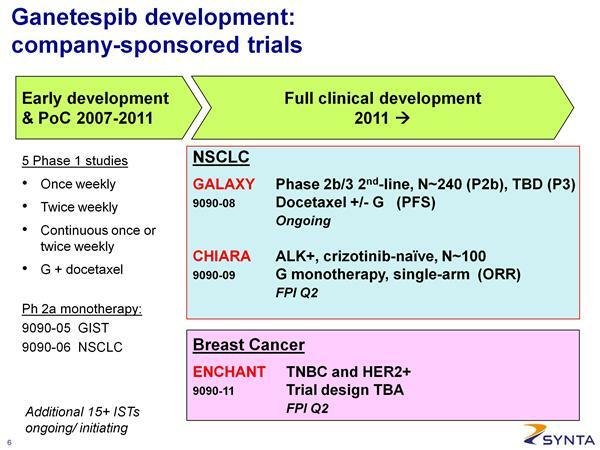 Our Hsp90 inhibitor patent portfolio covers ganetespib and structurally related analogs, pharmaceutical compositions, and methods for treating cancer. Additionally, we have multiple U.S. and corresponding foreign patent applications directed to other Hsp90 inhibitors." Ocular toxicity has caused the abandonment (late 2010) of competitors including AUY-922 (9/10 at MTD had ocular toxicity, NVS) and SNXX5422 (PFE). These drugs (and 17dmag) caused apoptosis in the layer of photoreceptor cells, where protein folding and unfolding is critical. 3/14/11: Ganetespib (and 17-AAG) are less soluble than the above compounds and therefore do not accumulate in these cells to the same degree (see figure below on left). 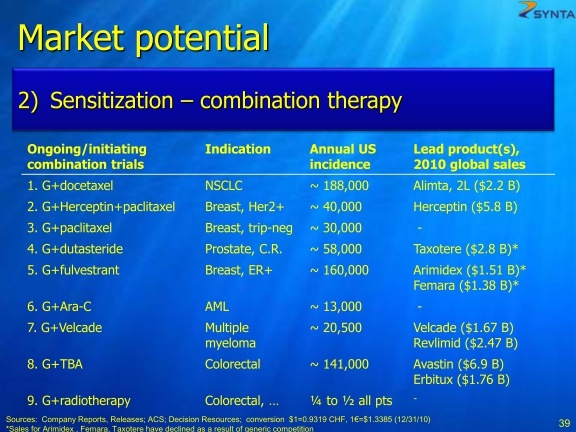 3/14/11: Option #1 is comparable to PFE's ALK inhibitor Xalkori (crizotinib) and Roche/Plexxicon's PLX4032 and would be a population of about 3000 pts per year. The larger combination indication would be 100x larger.